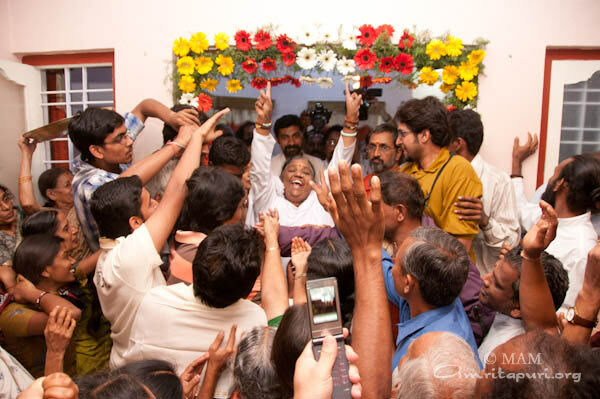 Amma was welcomed to Bengaluru, the capital of Karnataka, by several dignitaries– including the Chief Minister of Karnataka, B. S. Yeddyurappa, Justice P Sivaraj Patil and Justice Gururaj, Retired Supreme Court Justice of India, MN Venkitachalayya, as well as several major figures from the prominent IT industry based in Bengaluru. 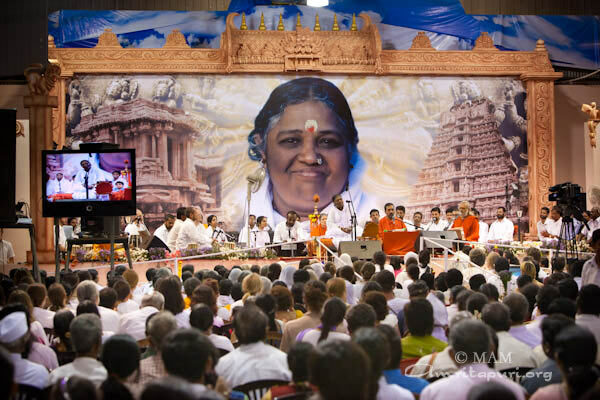 Amma introduced the Amala Bharatam Campaign on the first day, but in every one of her satsangs while in Bengaluru she continued to emphasize the importance of the project. 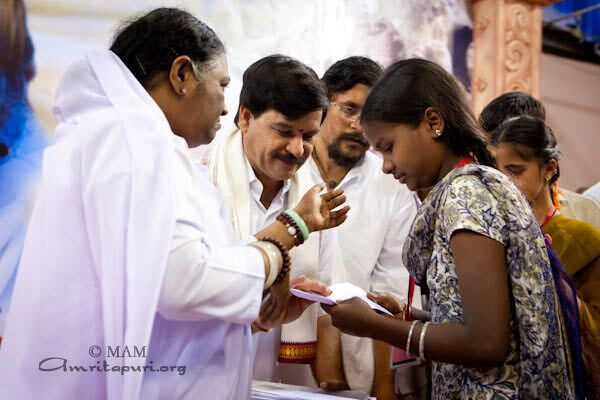 Each time she also distributed handkerchiefs to the students and handed them out to all the youth who came for darshan. 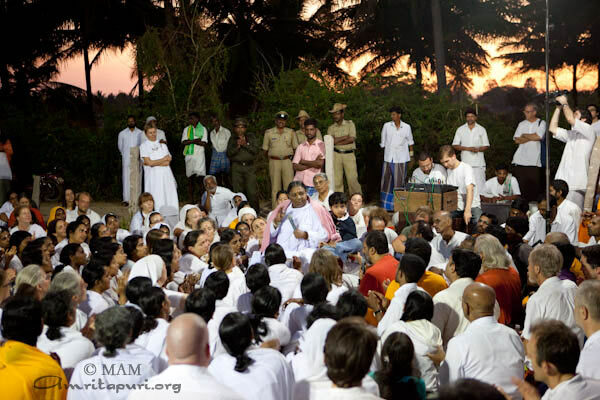 Bengaluru is also known at the ‘Garden City’ so it seemed fitting that Amma added that “if each school takes up the responsibility to clean and maintain a 5km area around their school, and if all the students dedicate themselves to the campaign, and we will make India into a garden within one year.” This idea was met by thunderous applause by the large crowd. 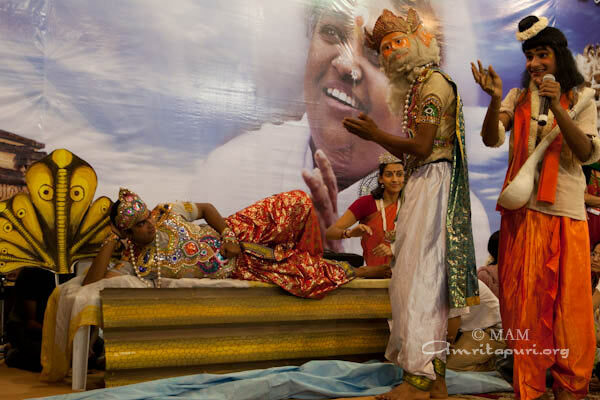 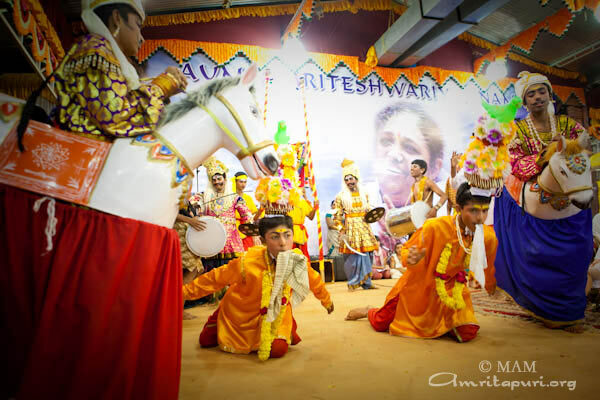 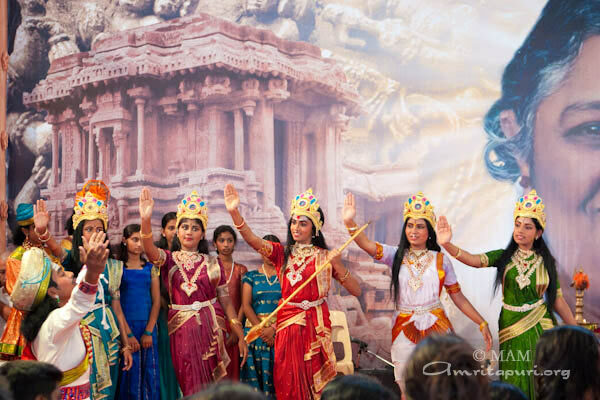 During Amma’s darshan Amrita University students performed a drama about Dasaavatar, the 10 avatars of Lord Vishnu. 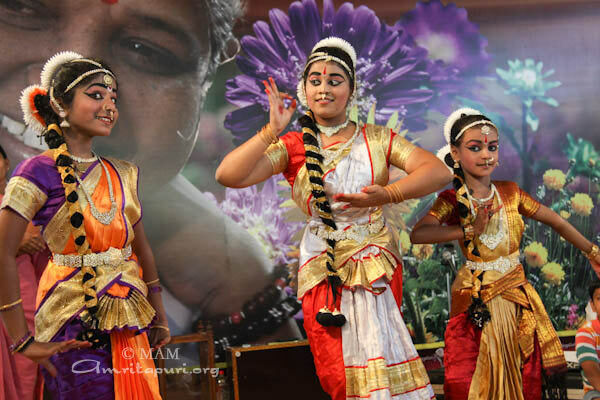 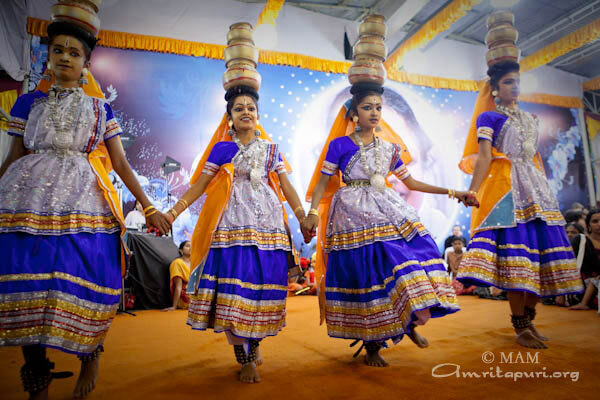 The students of Amrita Vidyalayam also performed several dances for Amma during darshan. 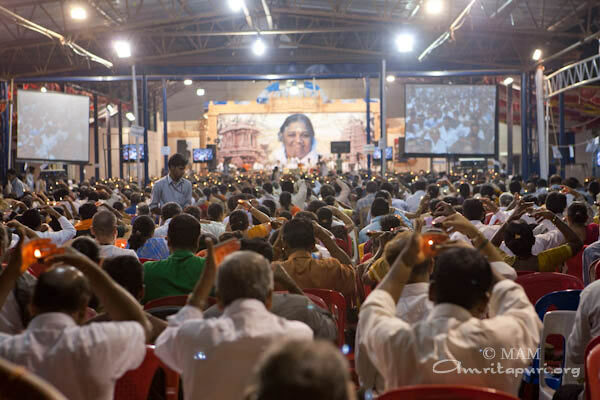 To the delight of all the local devotees Amma sang several new bhajans in Kannada, the language of Karnataka as well leading the manasa puja in Kannada. 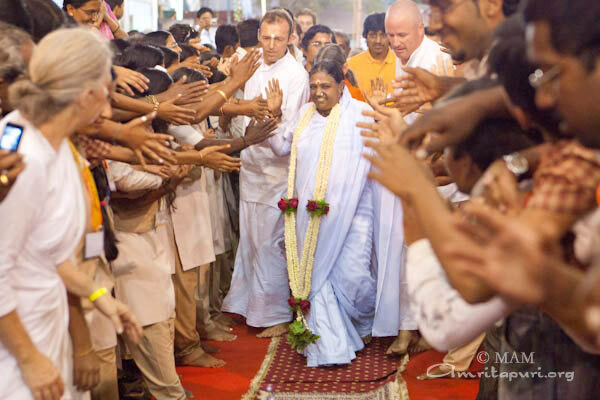 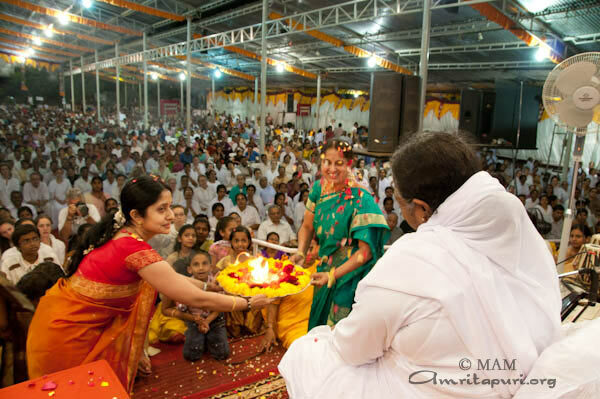 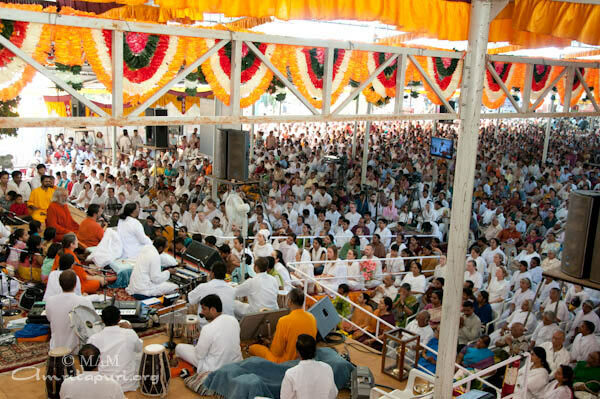 Amma visited Mysore for a Brahmastanam Temple Festival. 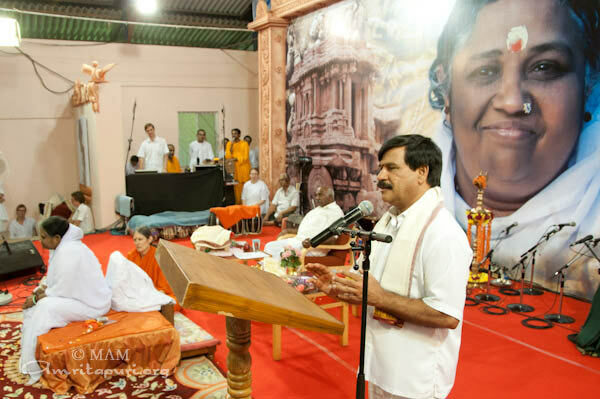 On the first program day Amma shared the stage with S.A. Ramdas, Minister for Medical Education, Karnataka and MP, H. Vishwanath. 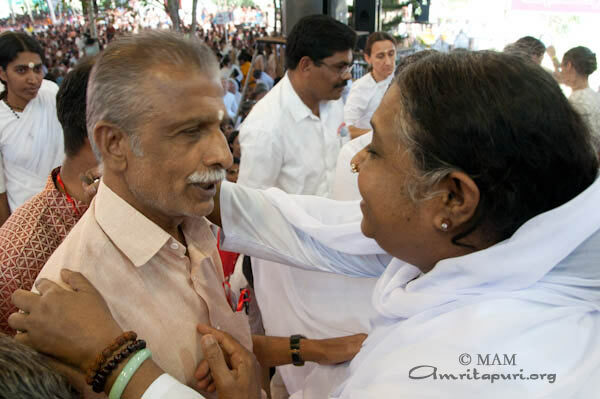 To mark Amma’s visit, the minister declared his intention to make Mysore a ‘healthy city’, free of plastic and trash, by the time Amma returns. 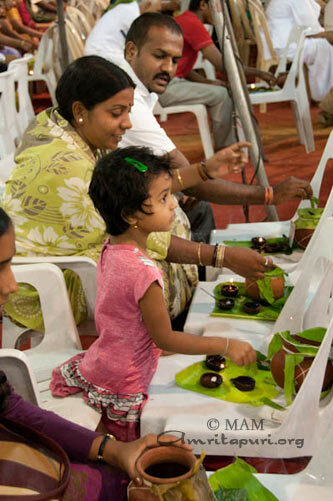 To achieve this the minister wants to enforce a law against littering. 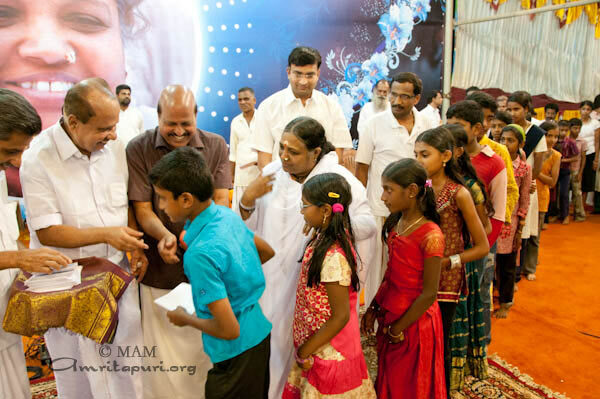 During the public function Amma distributed 25 more Vidyamritam scholarships to deserving children. 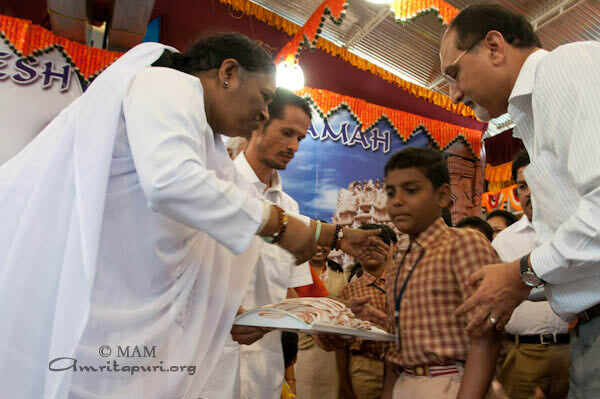 As part of the Amala Bharatam Campaign (ABC) she also handed out handkerchieves to students of Amrita Mysore Campus. 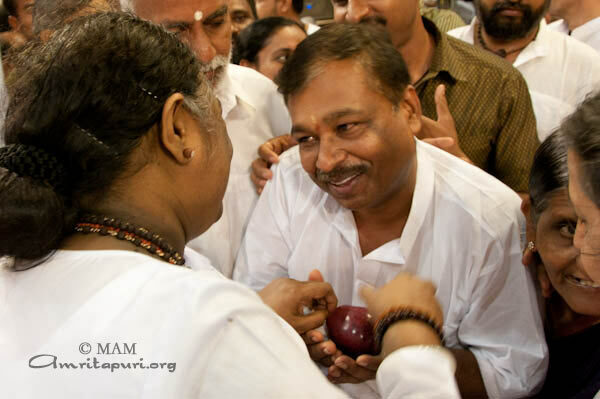 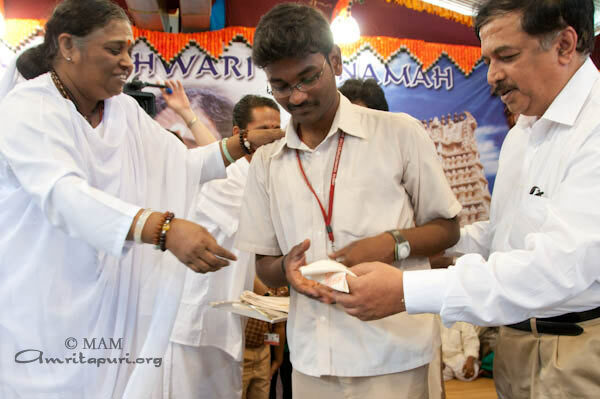 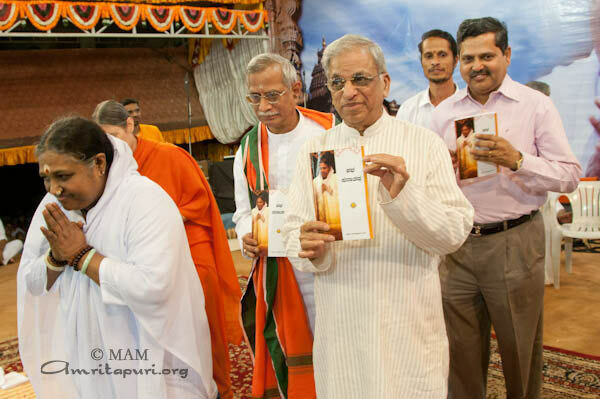 Additionally Amma handed out handkerchieves to all youth that came for darshan. 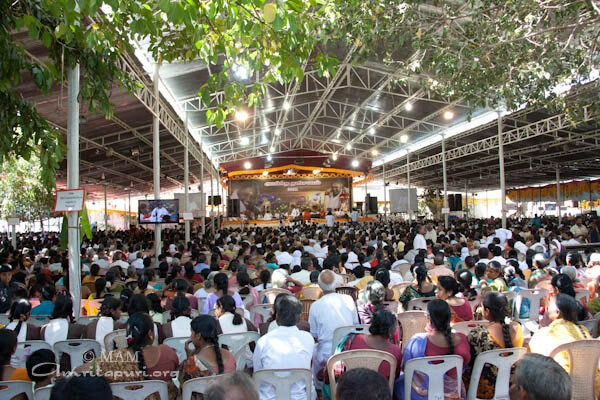 All over the program grounds ABC stalls were set up by many of Amma’s international devotees. 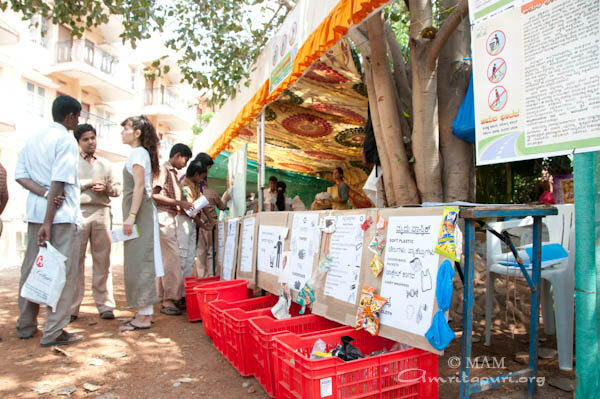 Here they collected, sorted and recycled the trash from the program and informed everyone about the importance of public health and hygiene. 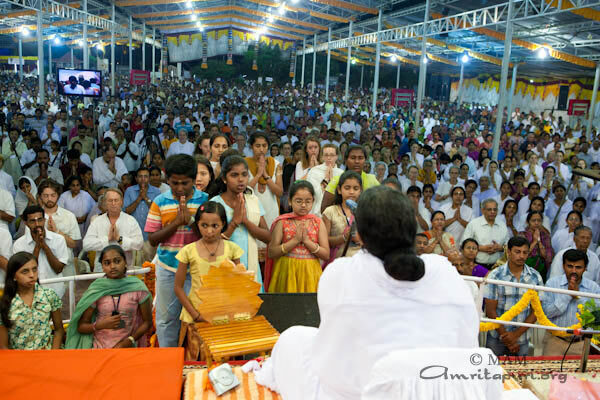 To the delight of the devotees, Amma sang many new bhajans in Kannada and also led the Manasa Puja in the local language. 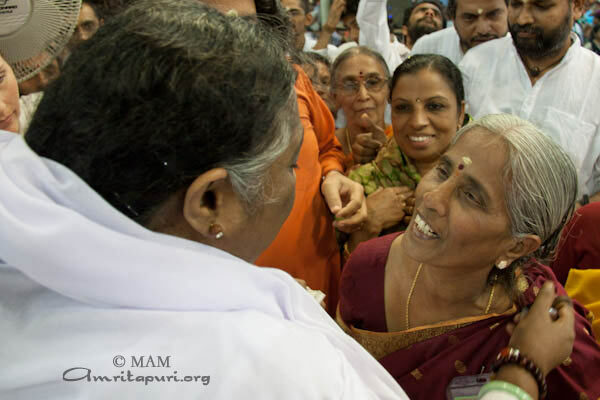 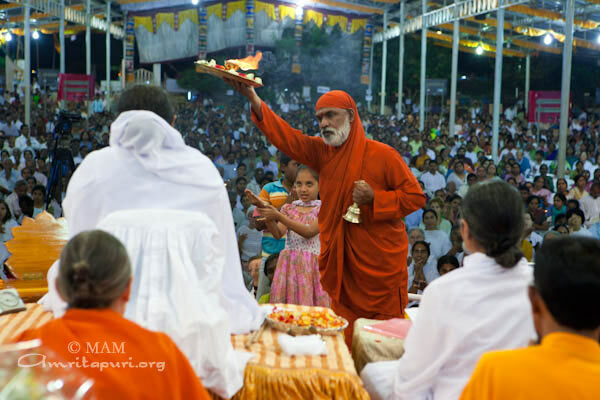 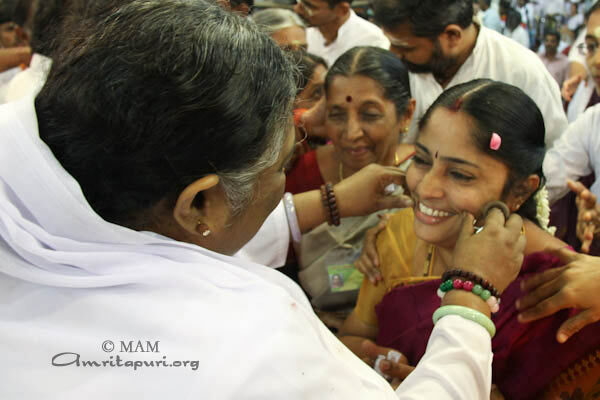 To end the two days of festival in Mysore, Amma delighted everyone by singing both Mayaji Menu Tu Chahidi and Mata Rana at the end of the last darshan. 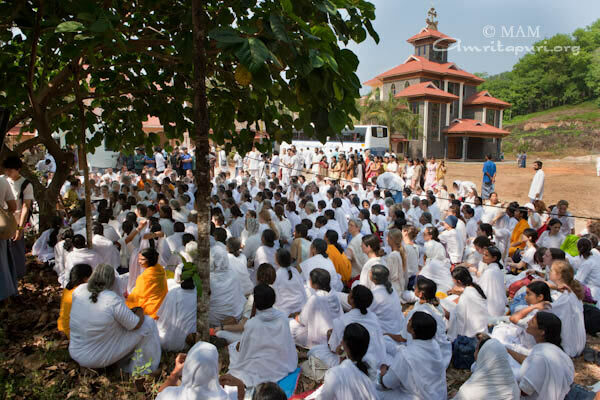 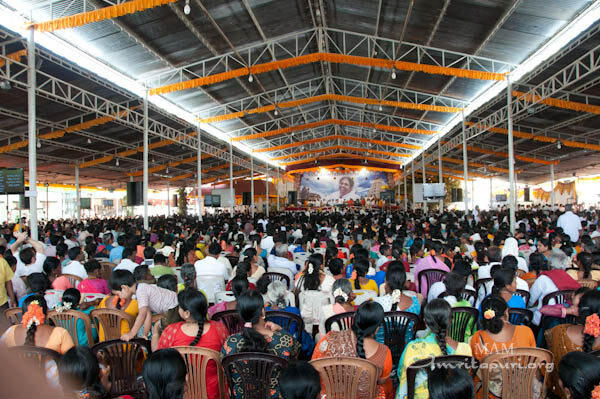 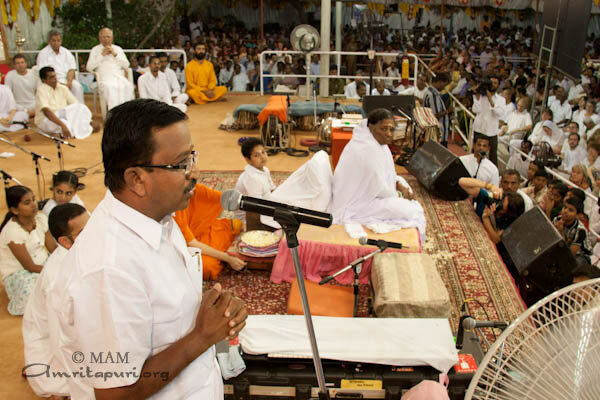 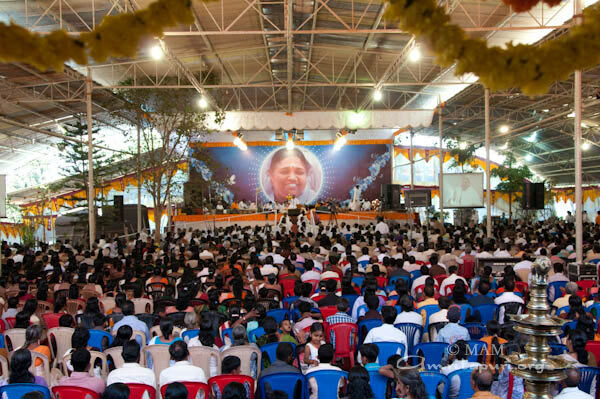 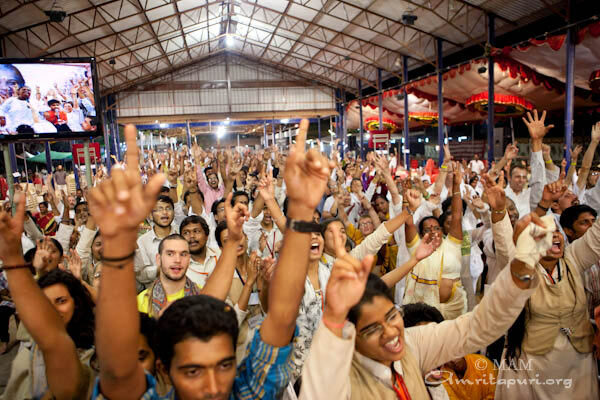 The first program of Amma’s 2011 Northern leg of Bharat Yatra was the Manathavadi Brahmastanam Temple Festival. 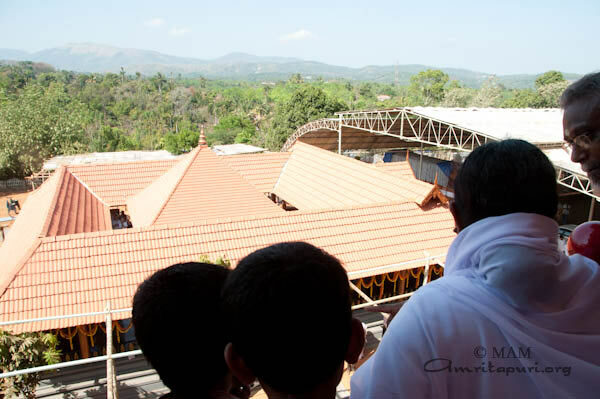 Located at nearly 3000 ft above sea level in the Western Ghats of Kerala, Manathavadi is known for it’s splendid landscape, mountains, lush greenery and fresh climate. 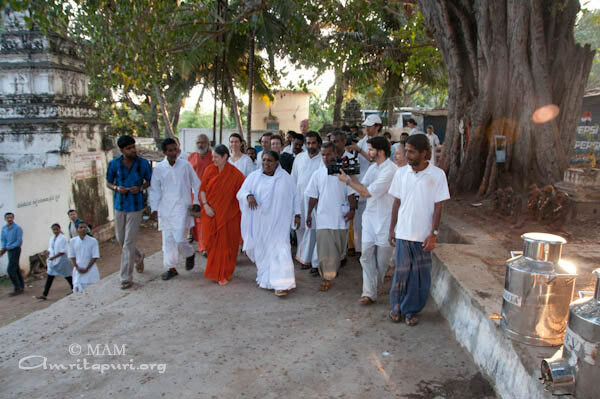 Amma first visited this mountain city in 1993. 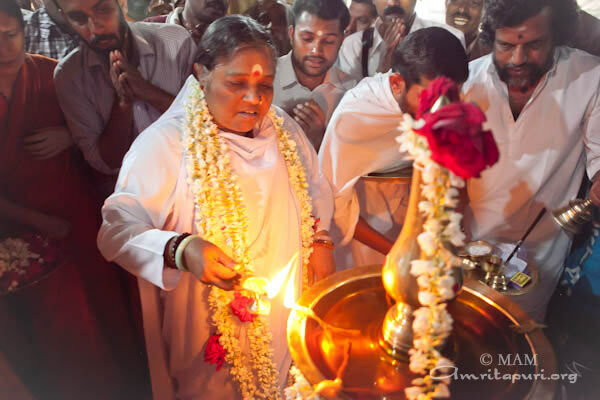 Upon arrival at the temple, Amma inaugurated the newly built chuttampalam (exterior hall around the inner temple) by lighting a traditional oil lamp. 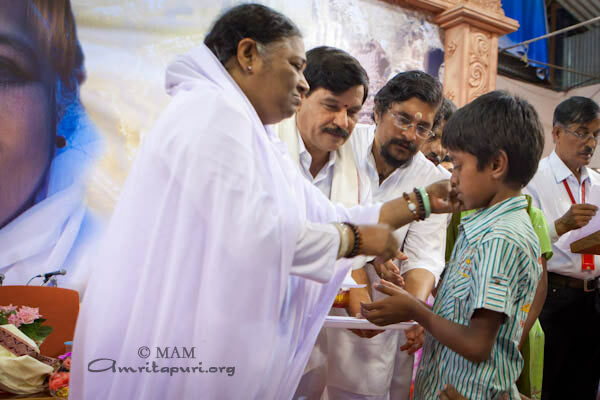 Previously, Amma had taken up several charitable activities in this area to support families, which are struggling to make ends meet. 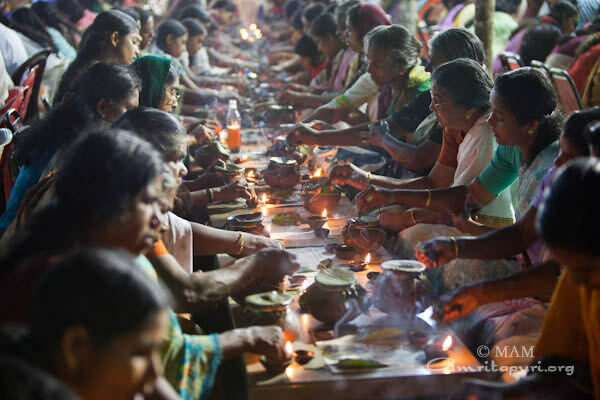 As part of the AmritaSREE program the ashram had started 10 new women’s groups, providing them with vocational training to run small scale businesses like spice and pickle production. 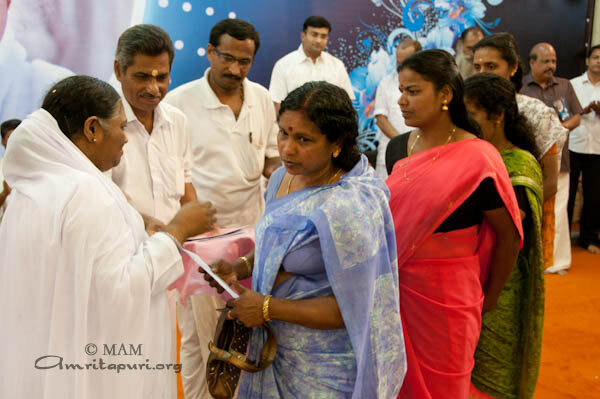 At the occasion of Amma’s visit these groups were given new working capital to further develop their businesses. 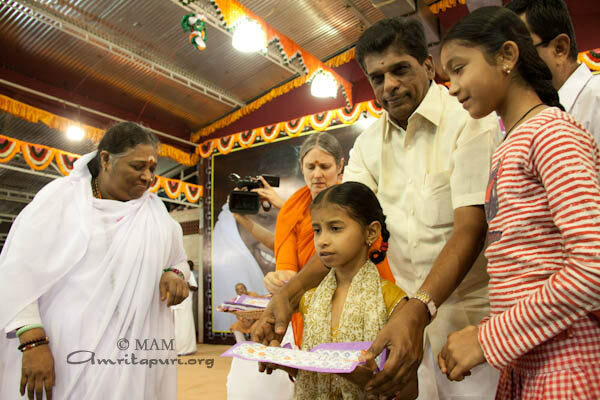 Additionally, 45 children of the members of the AmritaSREE program were given educational scholarships of Rs.1200 and another 50 children received educational scholarships as part of the Vidyamritam program. 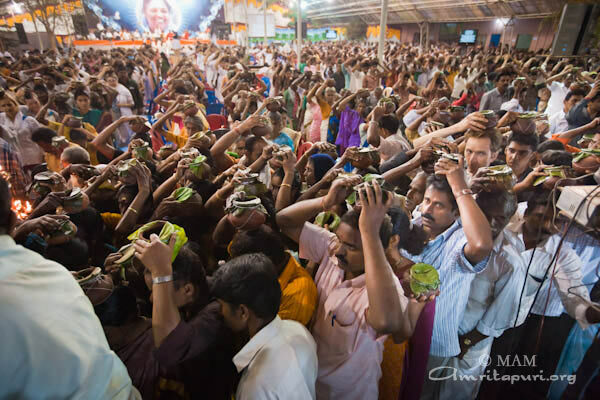 Having one of the highest densities of tribal population in Kerala, many of the tribal people came to receive Amma’s darshan and performed stunning dance routines for her. 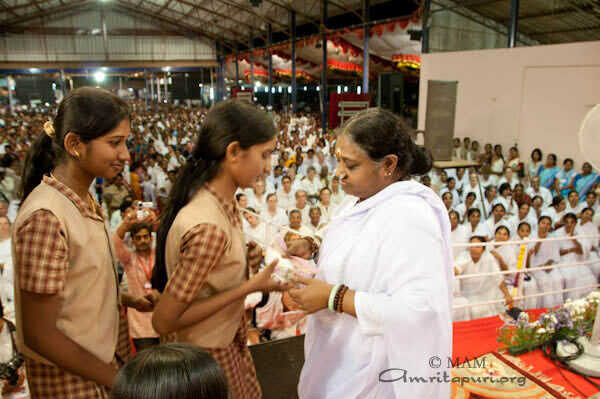 During her darshan, Amma distributed handkerchieves to the students as part of the Amala Bharatam Campaign, encouraging the villagers to use towels instead of spitting on the ground, thus contributing to public health and a hygienic environment. 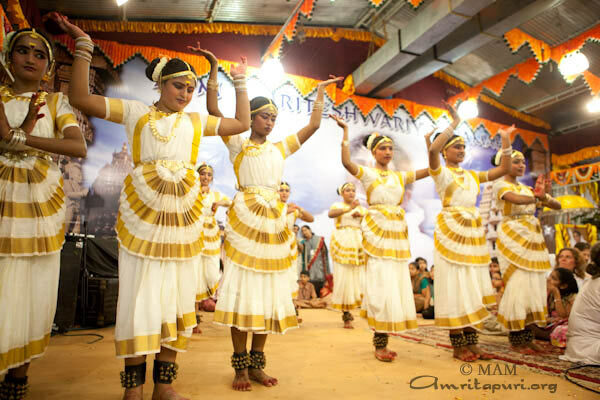 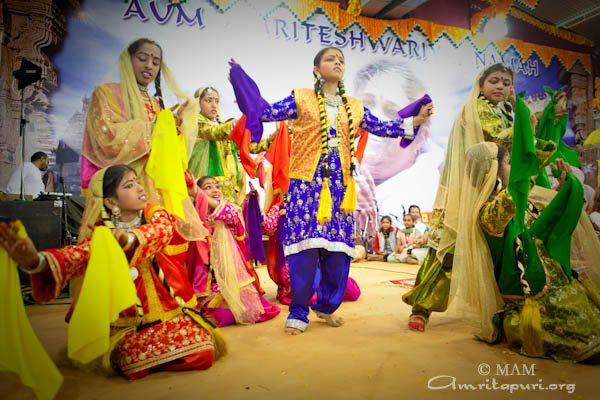 On both program days, Amrita Vidyalayam children presented wonderful cultural performances. 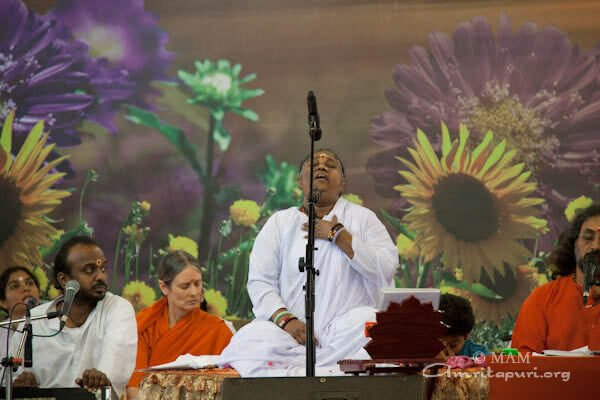 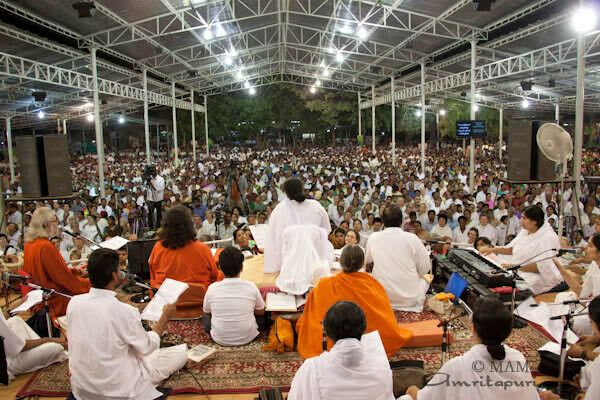 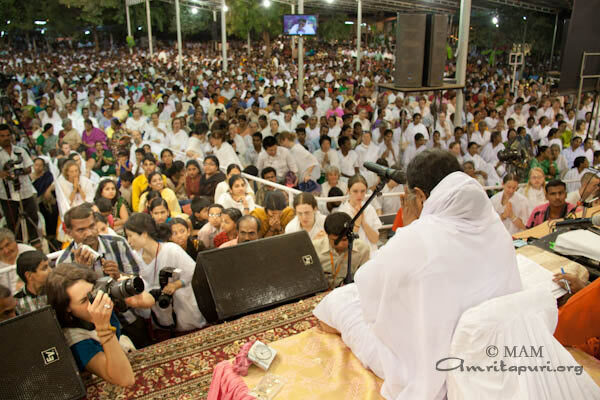 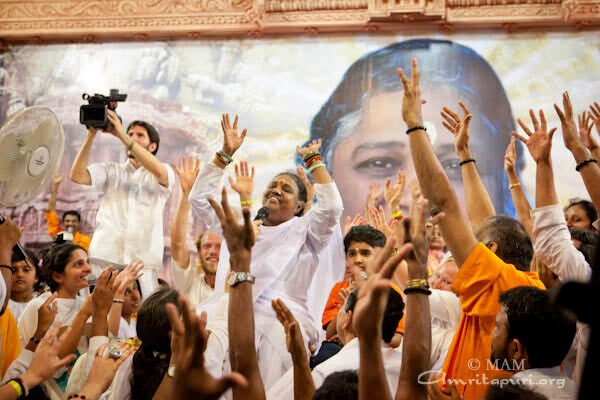 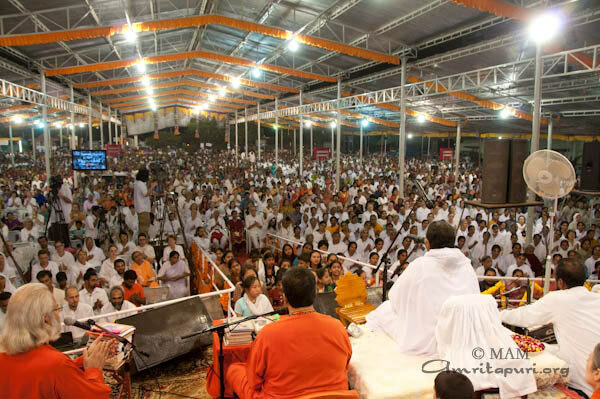 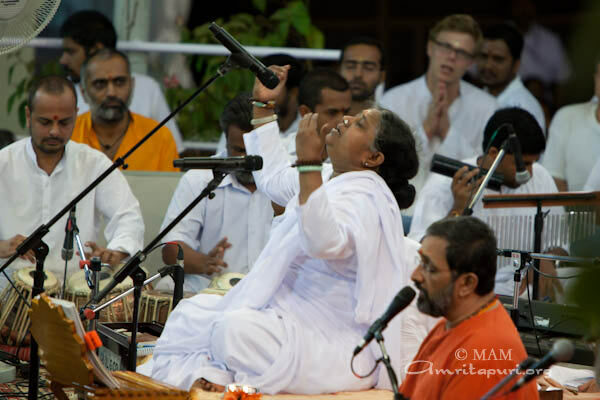 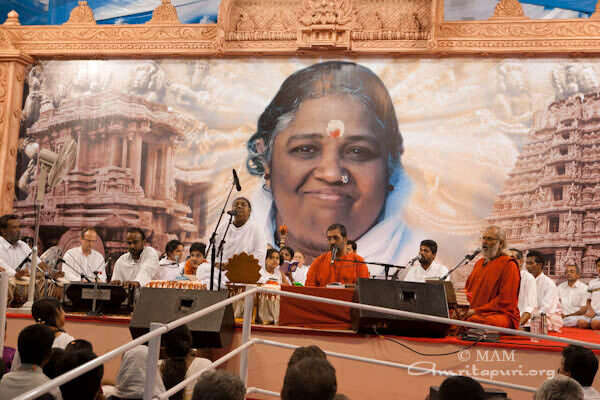 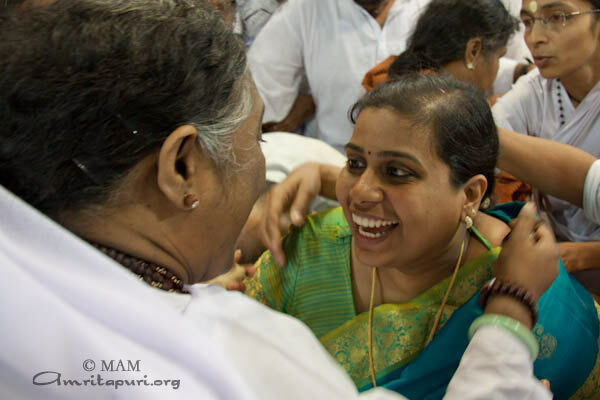 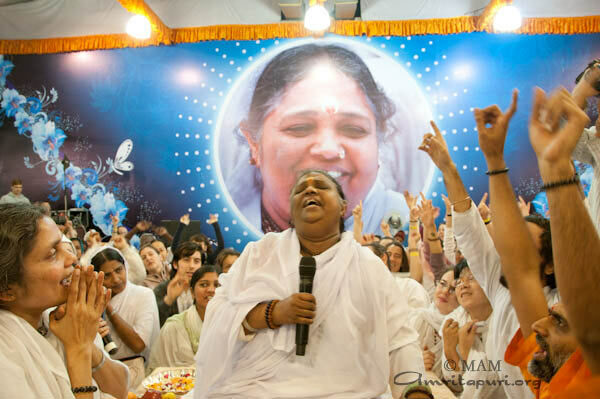 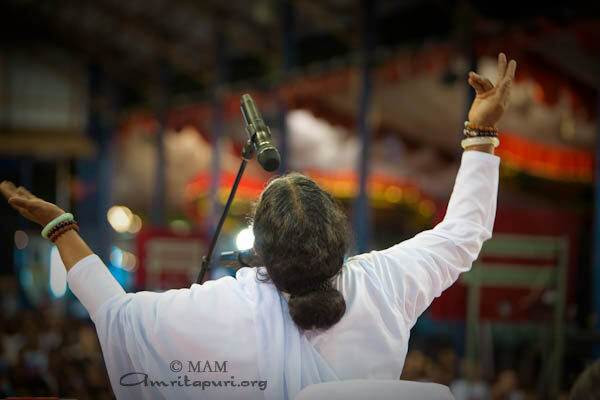 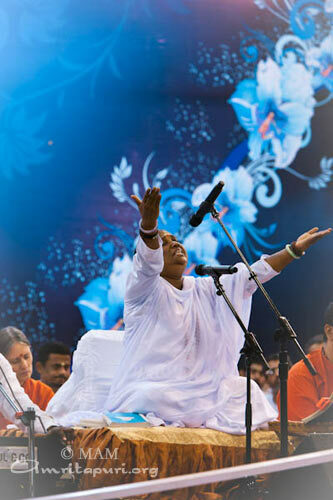 On the second day, at the end of darshan, Amma sang ‘Kota tumi janani’, embracing everyone once again – with her melodious, soul-stirring voice. 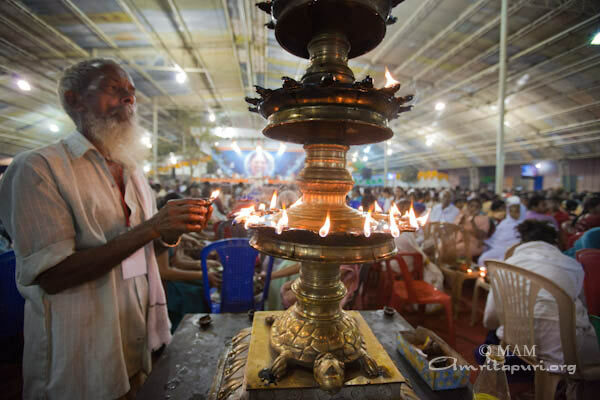 IAM—Integrated Amrita Meditation Technique lowers stress hormones, according to a study recently published in the 2011 volume of the international journal Evidence-Based Complementary & Alternative Medicine (eCAM), published by the Hindawi Publishing Corporation. 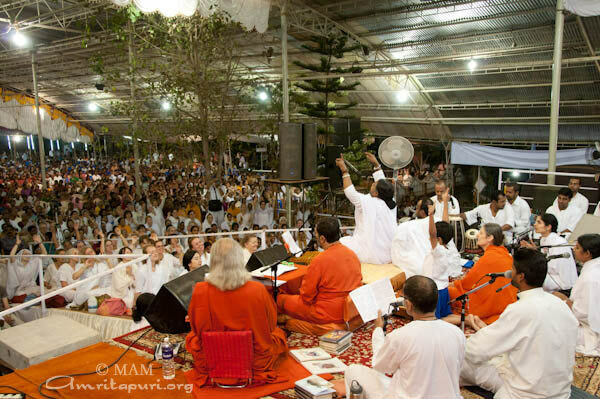 The five-year study, titled “The Effect of Meditation on Psycho-Physiological Variables,” examines the effect of IAM Technique on various psychological, physiological and biochemical parameters. 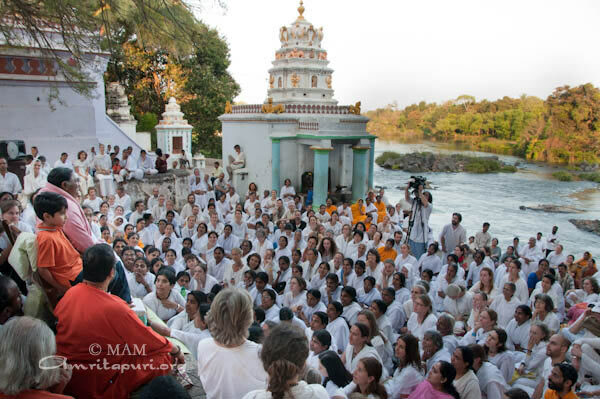 According to the study, practitioners of IAM Technique experience a reduction in stress-hormone adrenaline within 48 hours of beginning the practice. 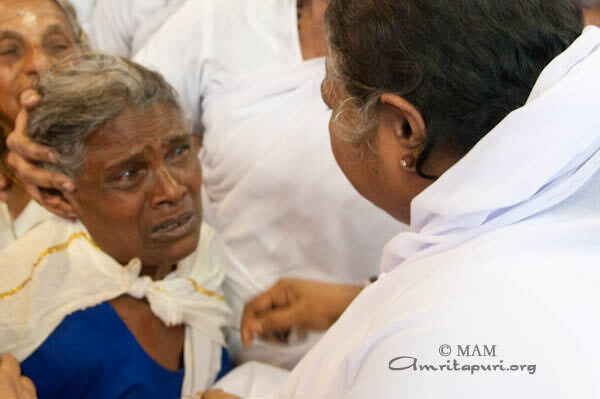 This reduction was shown to sustain in IAM Technique practitioners throughout the eight-month monitoring period accounted for by the study. 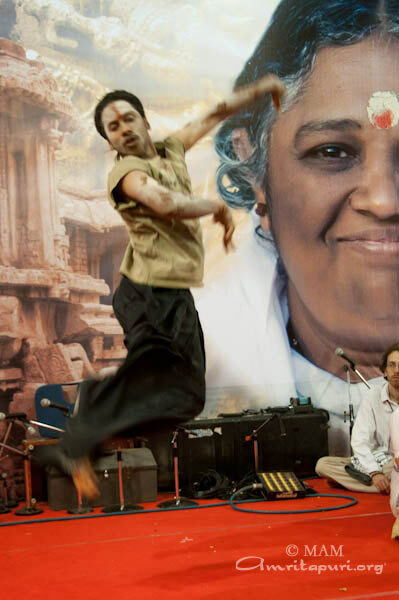 The study also showed a decline in stress-hormone cortisol following eight months of practice. 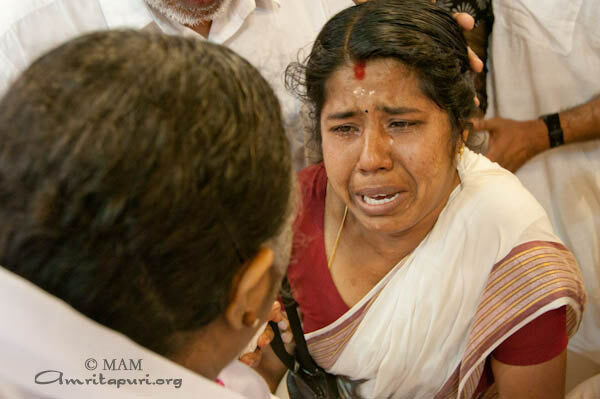 Other physiological results documented by the study include a significant decrease in the heart and respiratory rate of practitioners, as well as significant increase in IgA levels, which are associated with immunological benefits. 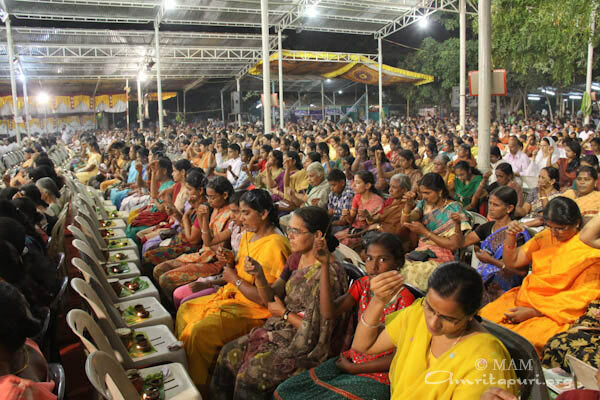 Through the study’s psychological-evaluation component, a major change was also recorded in the attitude of practitioners towards ‘stressful events.’ This study was conducted by Ms. Vandana Balakrishnan (research scholar), under the guidance of Dr. Harish Kumar, Head of the Department of Endocrinology; Prof. L. Saraswathy (HOD); and Prof. G.K. Suseeladevi of the Department of Physiology, at the Amrita Institute of Medical Sciences (AIMS) in Cochin. 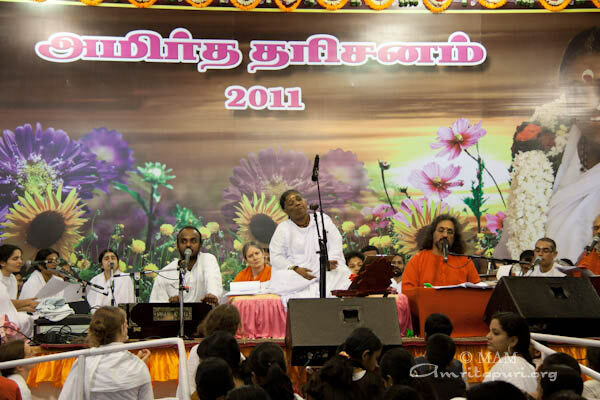 Prof. K.R. 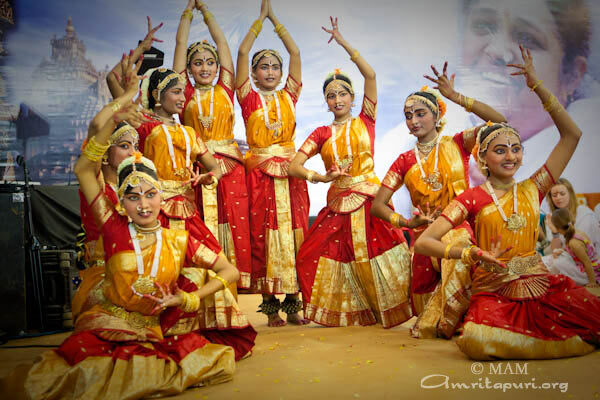 Sundaram, HOD, Department of Biostatistics at AIMS, provided the statistical support. 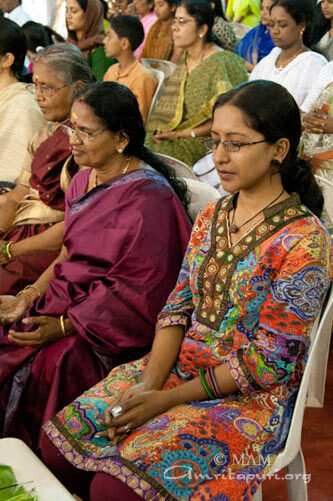 The results of the study have given rise to further research, including a study on the effect of IAM Technique on relieving stress amongst cancer patients undergoing treatment, as well as the impact of the technique in relieving hypertension. 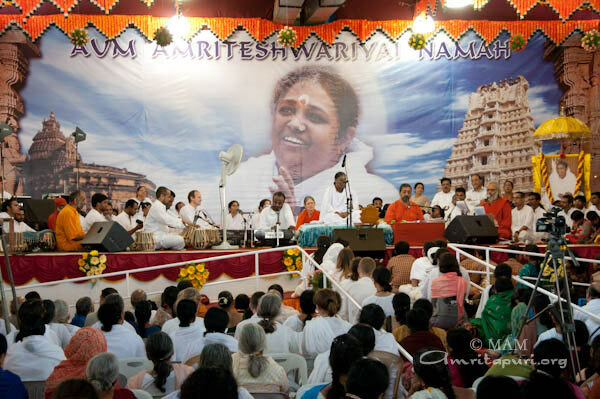 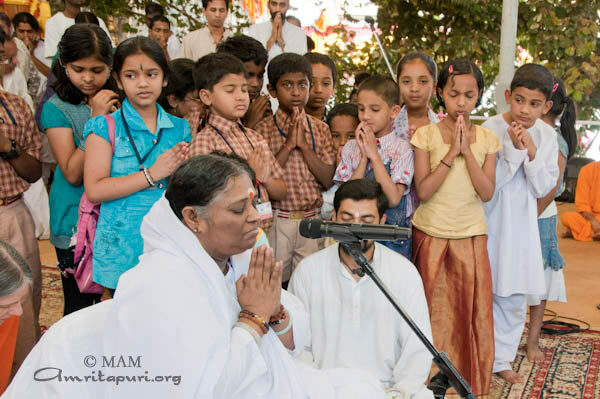 IAM Technique is taught free of charge throughout the world by representatives of the Mata Amritanandamayi Math (MAM), the non-governmental organization of renowned humanitarian and spiritual leader Sri Mata Amritanandamayi Devi (Amma). 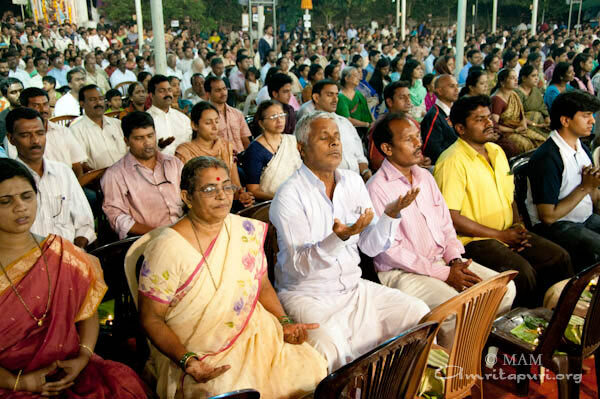 It comprises a combination of yogic postures, breathing practices and mental-concentration exercises. 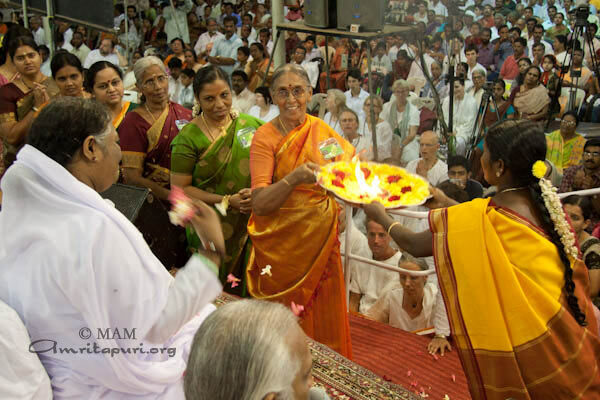 MAM has been teaching the technique to the public since 2003. 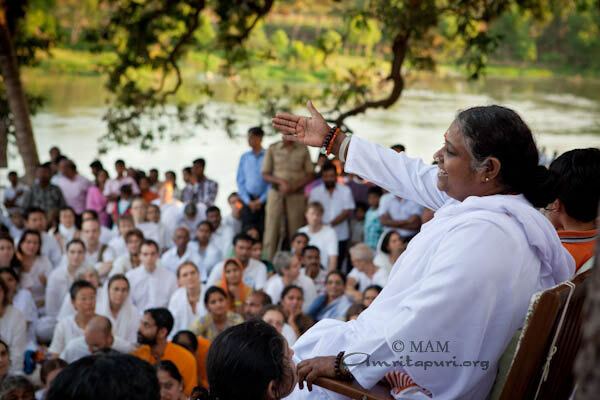 In 2008, at the request of the Indian government, MAM began teaching IAM Technique on a widespread scale to India’s military and paramilitary soldiers. 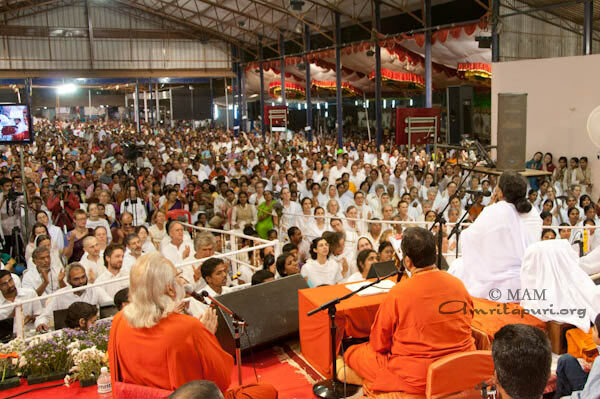 The technique is also being taught in schools and colleges throughout India, as well as to employees of businesses corporations, including Infosys, BSNL and IIM. 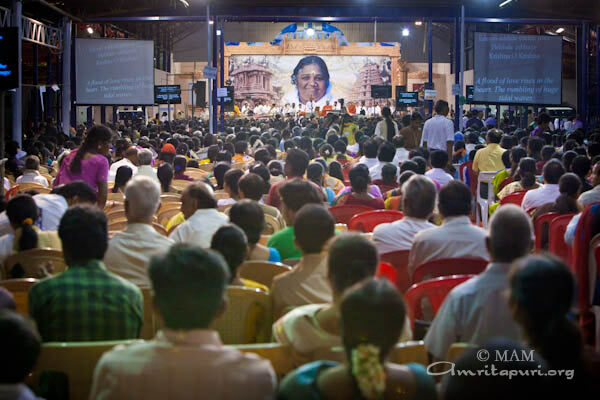 Amma’s 2nd leg of Bharata Yatra 2011 came to an end with a public program and a one day Brahmastanam Temple Festival in Kovai, Tamil Nadu. 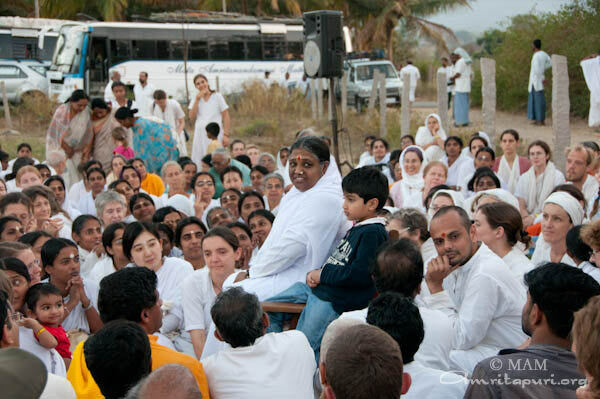 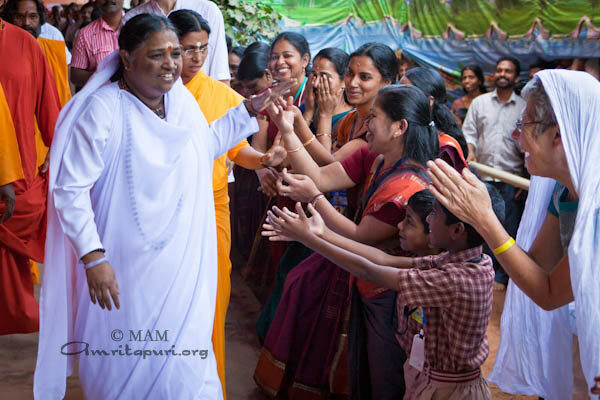 “Amma is adored as the one who embraces the world. 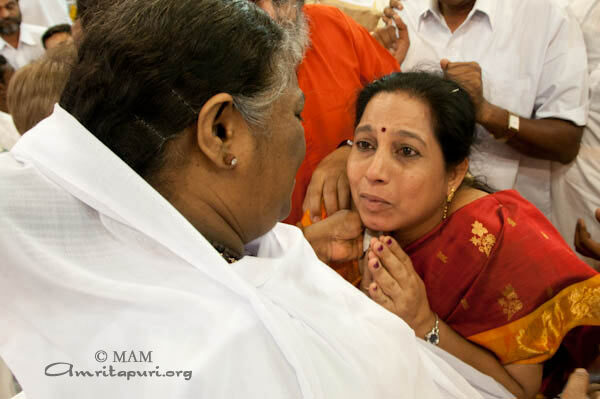 The reason is that only Amma can wholeheartedly embrace her children’s anger, needs and love. 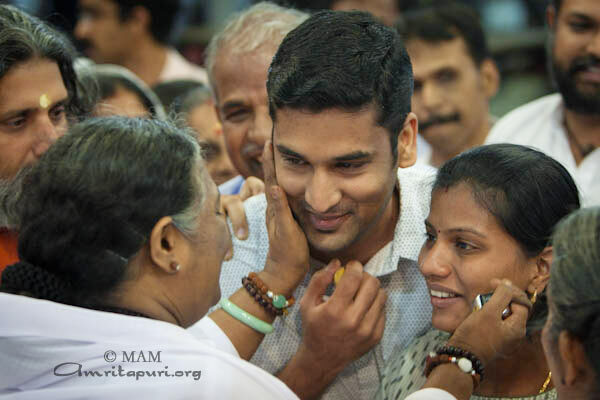 There is nobody else like that. 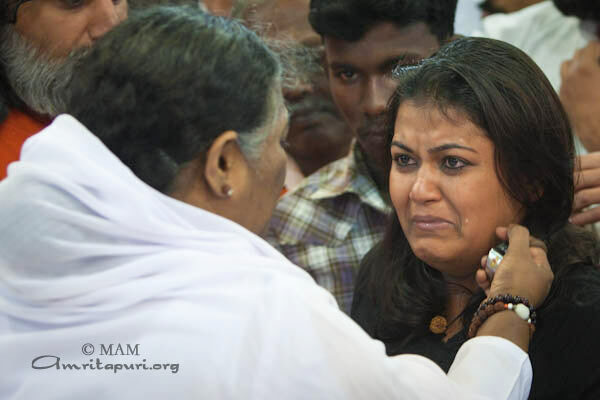 Wherever there is grief in the world, Amma is always there to offer consolation and sheds tears with those that are crying. Whatever be the situation, there is no organization anywhere in the world doing service like Mata Amritanandamayi Math. 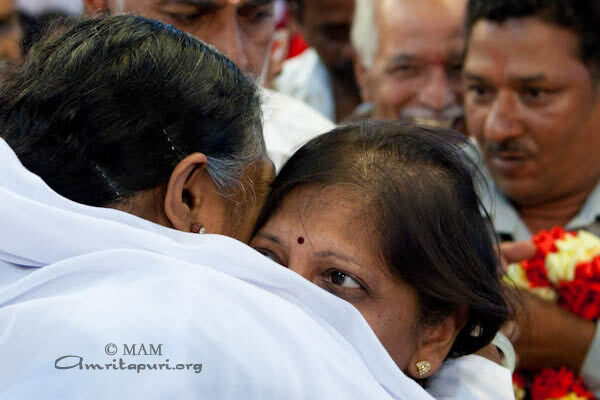 We are very lucky to get your embrace. 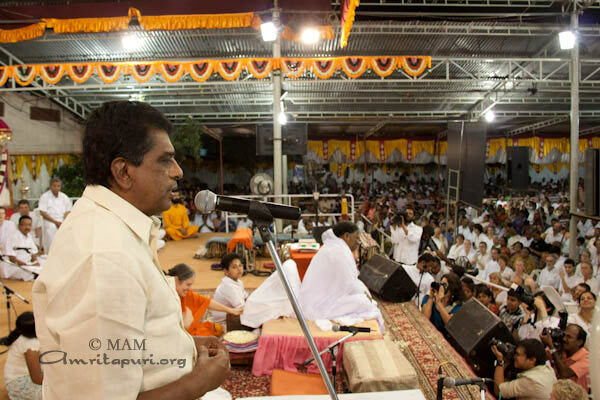 This alone is enough for our life to be successful.” said R.M. 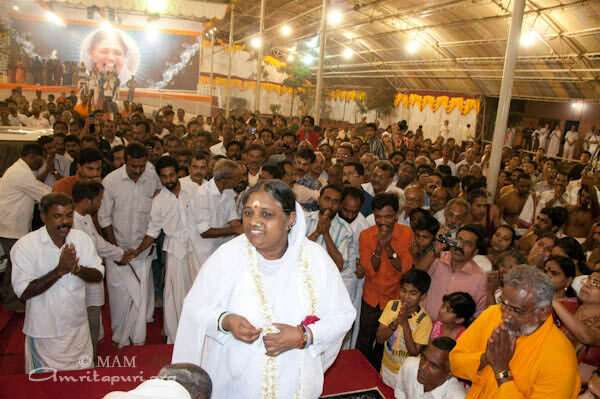 Palanisamy MLA of Modakurichi. 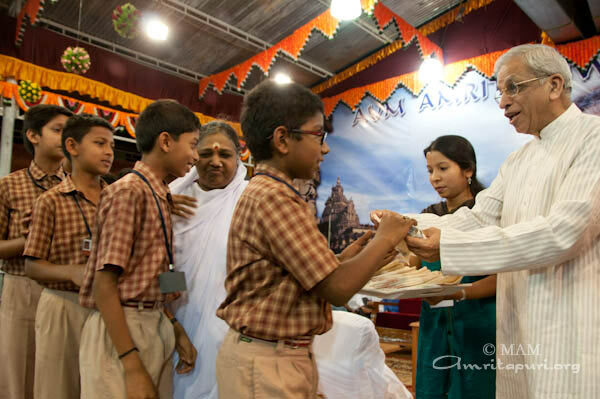 As on all stops of this Bharata Yatra, Amma gave a way free handkerchiefs to the students who came for darshan, encouraging them not to spit on the ground – as part of the Amala Bharatam Campaign. 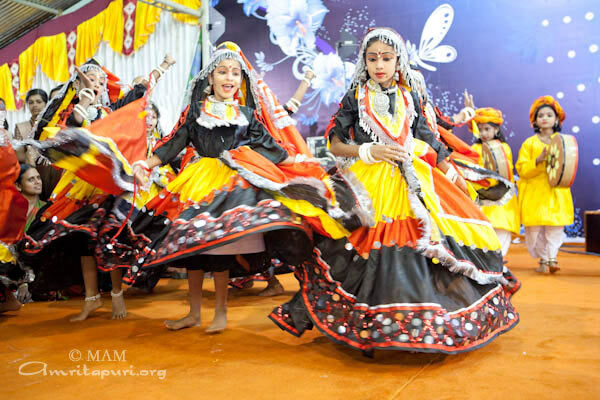 However, in this area the ABC program has long been implemented by the students of Amrita Vishwa Vidyapeetam, Ettimidai Campus. 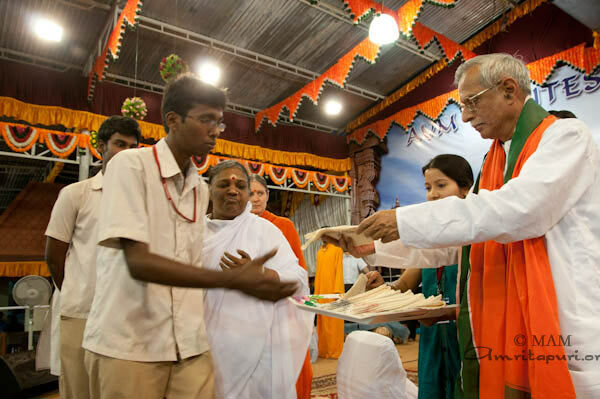 In several clean-up initiatives hundreds of students have been cleaning up public places like bus stops and road sides. 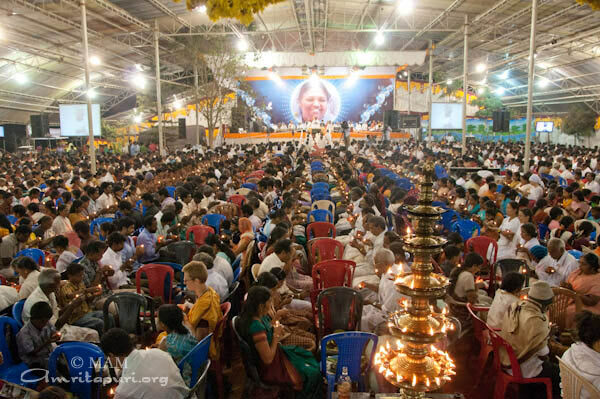 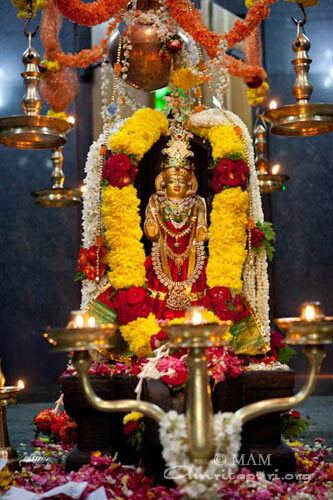 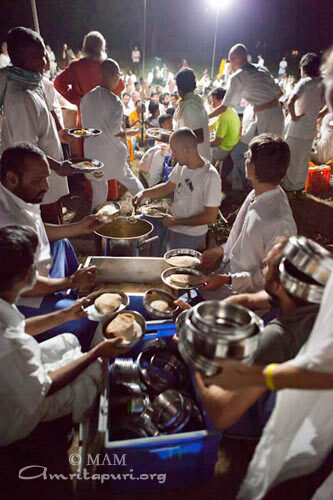 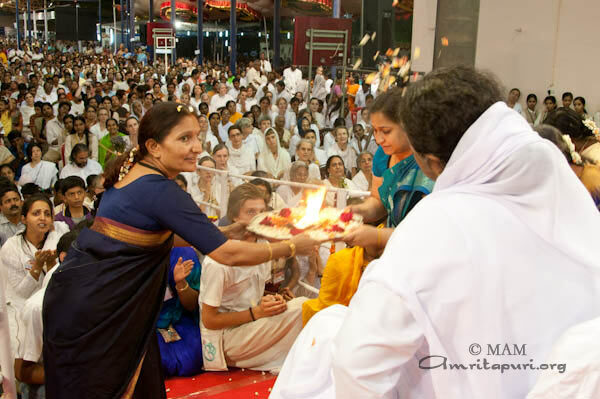 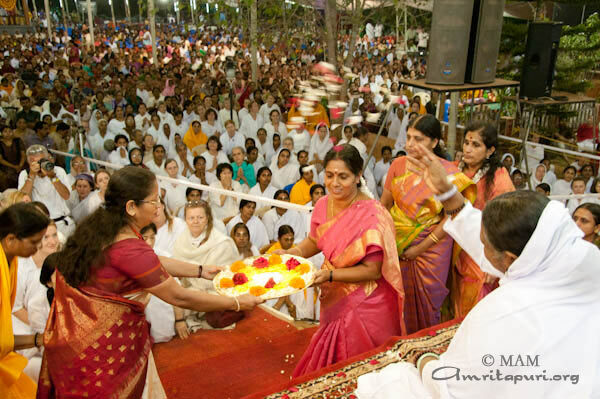 To the delight of the devotees, Amma herself led the manasa puja in tamil and sang several Tamil bhajans. 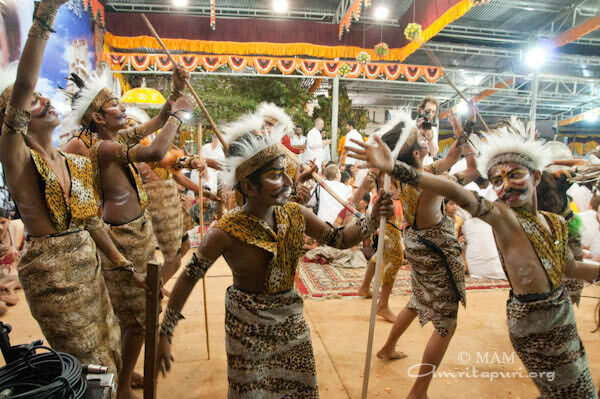 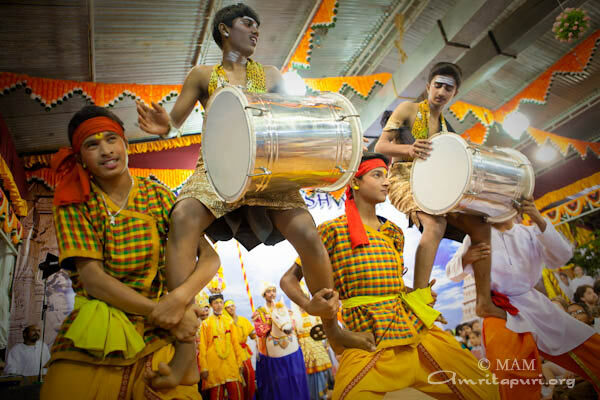 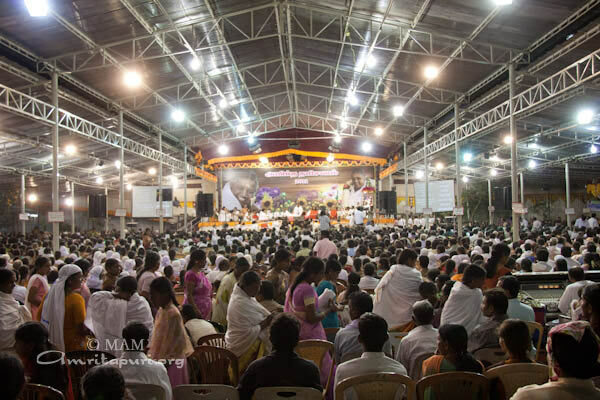 On both program evenings the devotees from Baduka, a tribal community from Ooty, performed traditional music and dance in front of the stage, while Amma continued giving darshan. 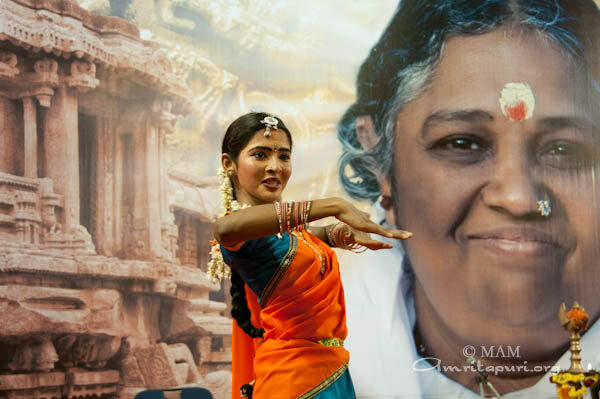 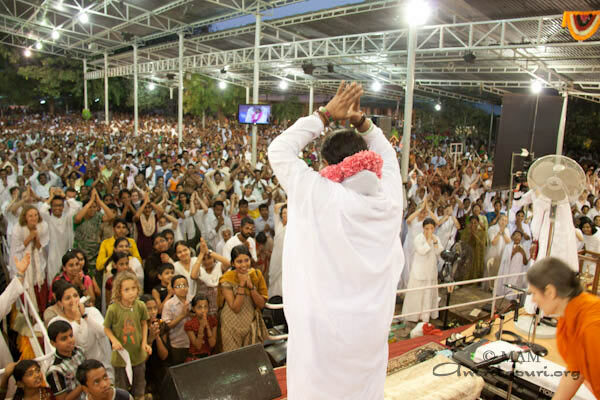 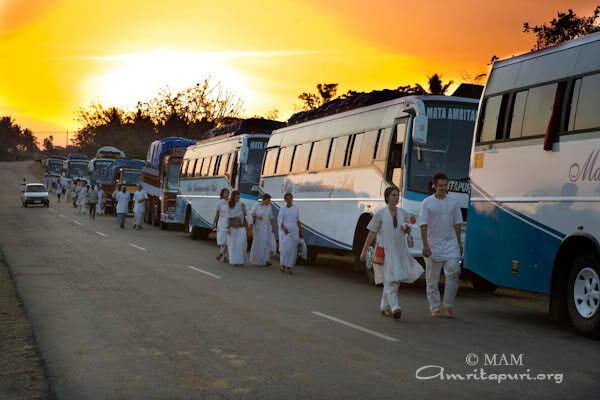 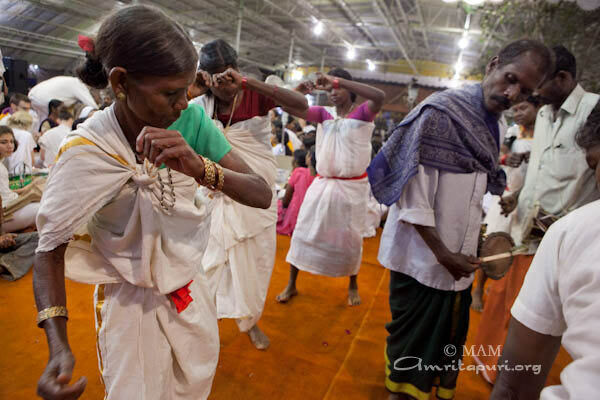 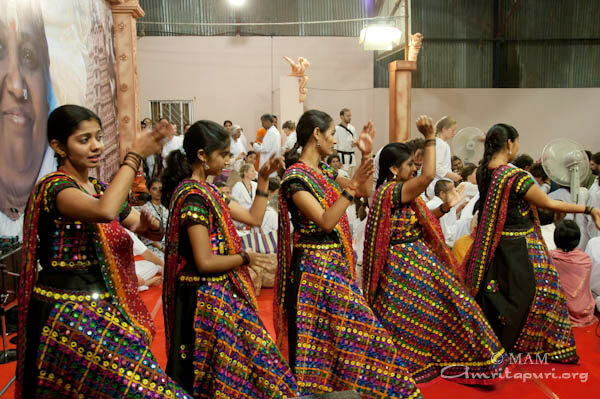 The rhythmic and lively tunes inspired a large crowd to dance until the early morning hours, making the Kovai program, a celebration of the unity and happiness that is ever abundant around Amma.